Proof that I'm still a bibliophile (in case anyone was wondering). 80. God Gave Wine by Kenneth Gentry, Jr.
* These are books I finished reading in 2015, not the ones I started or the ones I didn't get done. I read a bunch of them for escapist fun, some for/with my kids, and a lot of them just to learn and grow. This year because of my illness, I lost track a couple of times and had to reassemble them later, so the order is a little off. Each of our Advent Readings this year have been centered on John 16:33, the memory verse that our entire church has been learning together by heart. On the First Sunday of Advent, Nancy Wertz and Lucinda Socoski lit our first candle, a candle of lament. Lament. To lament is to express grief and sadness because things are not as they should be. Anybody feeling the weight of that this Christmas season? Our world is in trouble. Our world is deeply broken because of sin. When our first parents, Adam and Eve, disobeyed God, our world went from “very good” to “cursed,” and now things are not as they should be. Terrorism, war, disasters, disease, pain, conflict, and persecution are now commonplace because our world is damaged and things are not as they should be. And that’s true for us on a personal level, too. Many of you have lost a loved one in the last twelve months, and Christmas while nice is also hard because someone special is missing around the table. Our church family had to say goodbye to one of our dearest and best members, Blair Murray, this year. Christmas Eve tonight is not the same because he’s not here. And you know what? It’s okay to feel sad about that. It’s okay to lament, to grieve, to feel bad because things are not as they should be. The Bible encourages us to weep with those who weep. Our Lord Jesus Himself wept at the tomb of His friend Lazarus. Followers of Jesus are not stoics who feel nothing. We know that things in our world are not as they should be and that it is wrong to pretend that they are. So if you are hurting this Christmas season, that’s okay. It’s okay to be sad, to be sorrowful. It’s right to lament. On the second Sunday of Advent, Todd and Heather Dobo and their boys lit our second candle and said that it was a candle of hope. Yes, the world was broken by sin, but God had a plan from the beginning to fix this problem. For the last few Sundays we’ve been learning about the Big Story of the Bible. The Big Story that we are all living in. In fact, on January 3rd, all of our Sunday School classes are going to embark on a journey all the way through the Bible from beginning to end including the parts that many have never read before and putting the pieces together. We’d love to have you and your kids join us for those new classes called, “The Gospel Project.” It’s a study of the Big Story of the World that we are living in right now. And for Christians, it’s a story of hope. The Old Testament predicted a messiah, an anointed Savior who would solve all of the world’s problems and usher in an eternal peace. Oh! Doesn’t that sound good? And that’s exactly what the angels said that first Christmas to the shepherds who were keeping watch of their flocks by night. They said that the promise had been fulfilled. The prince of peace has come. If you know Jesus you will have peace. Peace with God. Peace with others. And peace within. If you don’t know Jesus you will not have peace. You’ll have war with God, war with others, and war within. Put your hope in Jesus and you will have peace. His peace is unlike anything the world offers and will never end. Those words have become very precious to me in the last few weeks. To take heart means to take stock of your situation and to find your hope and peace in Jesus. Yes, in this world you will have trouble, but take heart, Jesus has overcome the world. George and Betty Leathers lit our third candle on the third Sunday of Advent and told us that it was a candle of courage. Because our hope is in Jesus, we can take heart and be courageous right now. Even though our world is full of danger and trouble on every side, we do not have to live in fear. In fact, we should not live in fear. We can be bold for Jesus. We can take risks for Jesus. We can tell others about Jesus. We can obey Jesus and do the hard things that He wants us to do in our needy world. We also do not need to be afraid! My mom is kind of weird. She’s wonderful and I love her, but she has a very strange practice of reading the end of any book she’s reading before she reads the beginning or the middle. And that’s true even of mystery novels! She reads the ending first to see what happens and then decides whether or not to read the rest. That would kind of change how you feel as the story goes along, wouldn’t it? Heather and I have been watching some films recently that have a twist at the end that changes the whole story. But before we watched these films, we already knew about the twists that were coming so that changed how we experienced the films as opposed to those first audiences who didn’t know what was going to happen. We still enjoyed them. Maybe enjoyed them more because we knew the ending. Have you ever watched a ball game on tape know already who won? It really takes the worry out of it, doesn’t it? We know how our story ends. He’s talking about the Cross. What He’s going to do the very next day. He’s going to suffer and die, paying for our sins and giving us His righteousness. Our sins on Him. His righteousness on us. And then three days later, He would not only overcome sin but overcome death. And one day, Jesus will return in His Second Advent. His Second Coming. And He will make his blessings known as far as the curse is found. We know how our story ends, and that should give us courage while we live in it. Do you need some courage right now? Are you doing the things you know that you should be doing? That God wants you to do? Don’t chicken out. ... Take heart! Jesus has overcome the world. This last Sunday, the Hayles’ girls lit our fourth candle, and called it a candle of joy. Cheer up! Be full of joy! That’s what “take heart” means. It means rejoice because Jesus has overcome the world. We have every reason to be of good cheer. Yes, we have every reason to be sad. To lament. But at the same time we have every reason to rejoice. Because we know the end of the story. One day soon there will be no reason to lament, no reason to take courage, and even no reason to hope because our hope will have been fully realized! When Jesus Christ returns, He will truly bring joy to the world. And that day may be soon, and while we wait for it in faith, we rejoice at Christmastime because we know that Jesus has overcome the world. Our readings this year correspond with the EFCA Advent Devotional by Greg Strand. 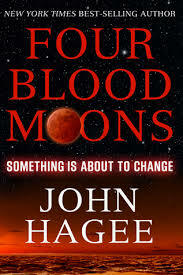 Hagee's book was not as bad as my worst book of 2013 (codenamed "Blech. "), but it's not a good book. Read Tim Challies' review for some of the reasons why. Have you ever read the story The Man Who Was Thursday by G.K. Chesterton? It starts out as one thing and by the end, you're really wondering what in the world you're reading. I had the same experience with Ortlund's book. I thought it was going to be a Christian zombie apocalypse book (strange enough as genres go! ), but by the end, I wasn't sure what genre we were in. Of course, as with Chesterton, I'm pretty sure that there was genius in this book--I just couldn't access it. Gawande movingly explores how Western culture has made end-of-life about medicine, safety and quantity of days instead of life, liberty and quality of days. His book is full of stories (profound, humorous and sometimes personal), research (clearly a scientist and a scholar) and insights (I read things I never knew before but instantly accepted when he said them). I couldn’t stop reading portions of this book out loud to anyone who would listen. The author is a true smith of words. Gawande is short on answers—our problems in this area seem intractable—but he does show the outline of ways forward. Surprisingly, even though he is a surgeon and the child of two doctors, he doesn’t believe that medicine is the primary answer (and often is the problem). As a Christian pastor, I am very aware of mortality and try to remind others to make preparations for the next life, but I don’t often think about the painful lead-up to that inevitable death. This book led me to make better and more informed plans for myself and my loved ones. The author is respectful of religion (his family is Hindu) but doesn’t seem to be a believer himself. I wonder what he would say differently if he were a Christian. Highly recommended but not to be read in one big gulp. The suffering is too real and raw. Best to read in pieces and ponder as you go. My kids are getting too big for storybook style books, but that doesn't stop me from reading them! The two that were the best were God Made All Of Me and The Biggest Story. 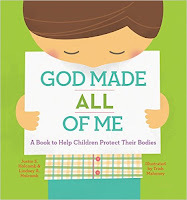 I got to interview the authors of God Made All of Me and learn about their ideas of how to keep children safe from abuse. And the The Biggest Story actually made it into this Advent sermon because it's all about the story in which we are living right now. Yesterday, I named my top 5 books read in 2015. Today, I list some "honorable mentions" that I also appreciated a good bit. What a privilege it is to own, read, and recommend books! This year, it was a joy to see a number of new books written by my own friends. Katie Faris used to be a member of our church, and Heather and I were privileged to participate in her wedding to Scott ten years ago. Four kids later, she has written an excellent little book on mothering. I got to interview her about the book this Fall and have her speak to groups of ladies at our church. "What do diapers, lullabies, laundry, and cleaning behind the baby's ears have to do with the gospel? Everything! In this gem of a book, our friend Katie Faris winsomely shares biblical wisdom on seeking the best for the children God has loaned us. Katie knows what she's talking about--we've seen her mothering in action--and she writes well. Sweet but not sentimental, direct but not demanding, Loving My Children helpfully connects the Bible's teaching on grace, sovereignty, and sanctification to the everyday hard work of being a mom. Heather and I highly recommend it." I also encourage people to check out Faris Press' Facebook page about Loving My Children, especially for the beautiful sharable posters they've created to illustrate the lessons in the book. Katie has also created a FREE study guide with discussion questions available for downloading on the Faris Press website. My pastor friend, Ronnie, just came out with this from my favorite publisher, CLC Publications. "I didn't want to read this book because I knew that I needed to read it, but I'm glad I did. With both keen insight and dry wit, my friend Ronnie explores our all-too-common sinful tendency to grumble and offers grace-laced answers to our problem. You may not want to read Stop Your Complaining either, but you'll be glad you did." It's hard to believe that 2015 is almost over and it's time for my third annual "top books" post. I didn’t get to read all that much this year. When I was sick, I didn't feel up to reading, and the rest of the year was a blur of activity, both pastoral and authorial. I did get to read some good fiction. Most of it was throwaway fun, but I also enjoyed re-reading the entire Aubrey/Maturin seafaring novels by Patrick O'Brian, some new (to me) page-turners by Edith Pargeter, and the unique Mark Helprin magnus opus, A Soldier of the Great War. - had the most personal impact on me, my thinking, my heart. - I was the most consistently enthusiastic about. - I kept coming back to again and again. A brilliant and unique primer on worldview. There has never been a book quite like What's Your Worldview? It's kind of like a cross between the old "Choose Your Own Adventure" books and "Philosophy 101." Anderson interactively introduces all of the basic worldviews that exist in terms that are easy to grasp AND constructively critiques each one. He shows how ideas are connected and have consequences. Readers answer each question for themselves and process through the maze (of course, you can read the book sequentially, as well) finding out the answer the title question and learning about how other people see the world at the same time. I think that adherents would say that Anderson is careful and fair in his descriptions of their worldviews even as he advocates for the claims of gospel-centered Christianity. He also writes concisely and with humor generously sprinkled throughout. So well done! When I was a young Christian, I read James Sire's The Universe Next Door which gave me these same categories. This book is a Universe Next Door primer for this generation. I can't recommend it highly enough and have 3 people I want to give copies to right now. I'm so glad I read this book. The authors respectfully argue for conjugal marriage based on the notion of common good, not from special revelation (God, Scripture, or church tradition). I'm not good at making arguments and wrangling about logic, but I can tell a compelling argument when I see one. I wish this was required reading for the US Supreme Court (and for a lot of other people, too). Highly recommended. Reading this led me to read Truth Overruled also by Ryan Anderson which I'm just completing this week. It's so sad that our culture has reached the point where we must argue for the view that marriage the union of one man and one woman. I'm thankful that these (mostly Catholic) authors have undertaken to do just that winsomely, carefully, reasonably, and respectfully in the face of increased hostility to the concept which has formed the basic building blocks of society for all of human history. Simply excellent. It captures our family's experience of this kind of suffering (and knowing God in the suffering) perfectly in beautiful, evocative, and hope-filled words. I learned a lot about not only Spurgeon's experience and wisdom on the subject, but our Lord Jesus' own experience of sorrows. Highly recommended for both sufferers and those who love them. Spurgeon's Sorrows very well might be the book on this list to have the longest influence on me. Mike has the distinction of having a book on this list two years in a row! I hope he has a good one come out next year, too. This book is easy to read and challenging at the same time. Easy, in the sense that Wittmer is an engaging writer with clear and funny illustrations. Challenging, in the sense that he provactively tests some false assumptions that we have tended to make in evangelicalism, especially about the spiritual importance of the hear-and-now (creation) in light of inbreaking (redemption) and the up-and-coming (consummation). I learned a lot, but not enough. I need to re-read this one soon. Mike has also released a set of compelling videos that correspond to each chapter. Distilled wisdom for personal ministry. Don't be fooled by the size or simplicity of this slender volume. Welch has packed a lot of understanding of how people tick and how to help them into short sentences, paragraphs and chapters. Bears repeating. Side by Side was not only a book but a conference by CCEF in 2015, and I had the privilege of sharing from Resisting Gossip in a breakout session called "Behind Their Backs." I'm thankful to the Lord for these books and commend them to you. [Matt's Messages] "Peace on Earth"
I know that I’m beginning to sound like a broken record, but I’m in love with our memory verse right now--John 16:33. I’ve shared John 16:33 at two funerals in the last two weeks. I’ve talked about John 16:33 in my prayer letters that have gone out and in counseling sessions in my office. When I talked to the FCA Bible Club on Tuesday with Mr. Learish, John 16:33 was what was on my lips for those students. On Wednesday at the Family Bible Night Christmas Program, there I was on stage quoting John 16:33 again. We’ve already said it together this morning, and it’s been read once more by the Hayles in our Advent Readings. John 16:33. There’s one little word in there that I want us to focus our attention on this morning. When the angels appeared to the shepherds and sang the first noel, the first announcement that Christmas had happened, they sang about peace, peace on earth. Because the Prince of Peace had been born. I don’t think we can imagine what it was like to be one of the shepherds hearing those angels sing. Praising God because God had sent His Son. That’s a reason to bring glory to God if I ever heard one! Because peace is in such short supply. Last week, we learned about a war that’s been going on since almost the beginning of history. We learned that you and I are living in a war-zone. That’s the story that we’re living in. There is a perpetual spiritual conflict raging in this world and it affects everything. That’s the story we are living in. By the way, The Gospel Project, our upcoming new Sunday School class, is all about that story, understanding the contours of that big story from Genesis to Revelation. I’m hoping that many of you will join us on that journey we’re going to start in a couple of weeks through the whole Bible. But that war that’s been going on for centuries means that peace is in short supply. Doesn’t that word sound so good? It seems like every time we turn on the news there is a new conflict. And not just national conflict, but conflict within nations. Our nation is so divided right now. We don’t have a civil war going on, but there is so little that our people do agree upon. My heart breaks when I turn on the computer and see the deep divisions in our country. And not just among the general population, but even in the professing church. There is so much infighting among people who call themselves Christians in America. And in families. So many break-ups and divorces and abuse. So much brokenness, and not very much peace. But into a world at war, the Prince of Peace was born. And these angels sang that He was bringing peace on Earth. You need to know that peace (in the Bible) is more than just the absence of conflict. And Jesus was born to bring that kind of peace. - Whom God has chosen. - Peace to the children of God. - Peace to those who have exercised faith in Jesus Christ. In Jesus, we get that peace. If you are outside of Jesus, there will be no peace. Jesus is where the peace comes from. As I was thinking about it this week, there are essentially three kinds of peace that Jesus brings. If you don’t have that, then you won’t have peace in any other meaningful way. Jesus came to bring us peace with God. Remember what we learned in Romans chapter 5, verse 1 last year? If you haven’t trusted in Jesus Christ, then you aren’t justified. You don’t have a righteous standing with God. God is, in fact, your enemy. You may not know it or acknowledge it, but the Bible says that it’s a fact. But hear the angels sing! Come to Christ this morning. Lay down your weapons and surrender to the Prince of Peace. Maybe your heart has been prepared for this morning. This is your morning of decision. This is the day that Christ becomes King in your life. Decide now to trust Him. Tell Him that you are sorry that you’ve sinned against Him and now want to belong to Him. He will not reject you. He will receive you with open arms and bring you peace. Become a faith follower of Jesus Christ today. Because in Him you may have peace. And if you have that kind of peace, then it will lead to peace with others. And of course, it’s a two way street, but peace with God can lead to peace with other people. Remember what we heard in Romans 12:18? Are you living at peace with others this Christmas? So often, it boils down to forgiveness. Christmas is about being forgiven. And being forgiven unleashes an amazing power within us to forgive others. Is there someone you are in conflict with this Christmas? Make it right with them. As much as it depends upon you, take advantage of Jesus’ peace and take Jesus’ peace to them. And the third of kind peace is one that I have been leaning hard upon Jesus for these last few months. That’s our inner choice to believe in Him and experience the peace that comes with it. “Take heart!” Jesus has overcome the world. Inner peace is basically the absence of fear. If you are right with God, what place does fear have in your heart? ‒ If God is for you, who can be against you? ‒ If God is your helper, what can man do to you? ‒ If God is at peace with you, what is worth worrying about? Peace with God is yours in Christ. And if you have that then you have nothing to fear. Cast it upon the One the angels sang about on the first Christmas morning. It seems to me that there are only two ways for there to be peace when there was a war. One way is for one of the warring parties to win and the other to lose. For there to be a conquering. To overcome. To win. To be victorious. And one day just like the Hayles’ read, Jesus’ victory will be complete and spread throughout the universe. And those on His side can rejoice in that. We don’t see the peace yet, not in full. But we know it’s coming. Because He was victorious on the cross and at the empty tomb. He has overcome the world, and we saw last week in Romans 16:20, Jesus will soon crush Satan under our feet. And that’s good news if you’re on His side. But bad news if you are not. He will bring ultimate peace by destroying His enemies. But there is another path to peace. Not just victory but reconciliation. That’s when the two warring parties go from being enemies to being friends. And that’s what Jesus did for those who will repent and trust in Him. 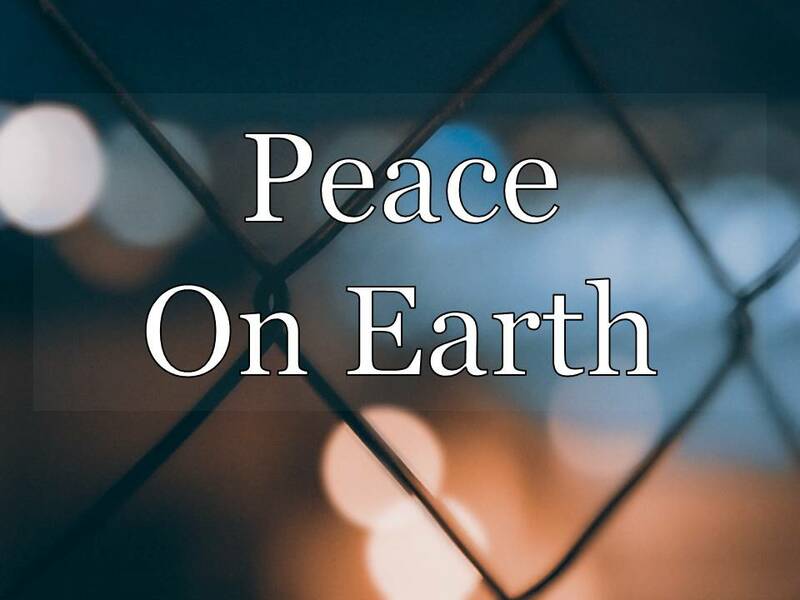 Peace on Earth for those who trust in Jesus. Peace now and peace forever. So, take heart. Jesus has come so that in him we may have peace. In this world, we will have trouble. But take heart! Jesus has overcome the world. For lo, the days are hastening on, by prophets seen of old. During this year’s Advent season, we are celebrating together our Lord Jesus’ promise from the Gospel of John, chapter 16, verse 33. Our first candle was a candle of lament. Our world has been full of trouble ever since the garden of Eden and it is good and right to express grief, sadness, and longing for our broken world to be fixed. Our second candle was a candle of hope. We hope in the promise of the Prince of Peace. His peace is unlike anything the world offers and will never end. Our third candle was a candle of courage. Because of our faith in Jesus, we do not have to live in fear and can obey Him even in a world full of danger and trouble. Our fourth candle is a candle of joy. “Good Christian men rejoice with heart and soul and voice” because we know the end of the story. Our Lord Jesus Christ has overcome the world and one day will make His blessings known as far as the curse is found. One day there will be no reason to lament, no reason to take courage, and even no reason to hope because our hope will have been fully realized! When Christ returns, He will truly bring joy to the world. That day may be soon, and while we wait for it in faith, we rejoice at Christmastime because we know that Jesus has over come the world. 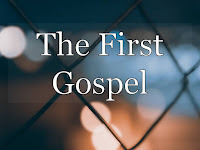 [Matt's Messages] "The First Gospel"
Three years ago, I began a new preaching tradition. Each year on the Sunday before our normal Christmas service (which will be next Sunday), I’m planning to preach on an Old Testament prophecy or foreshadowing of the Messiah. A prediction of Jesus Messiah from the Old Testament. That first year, I preached on Genesis 49:8-12 which was the fairly obscure passage where we get the phrase, “Lion of Judah.” The Messiah would be the “Long-Expected Lion.” Remember that? Two years ago? Some of you do. Last year, we focused on the prophecy of Immanuel from Isaiah chapters 7 and 8. Immanuel means, “God with us,” and we saw how Isaiah predicted that very thing. Or big name for it is the “Protoevangelion" or "Protoevangelium." The first time that God proclaimed the good news about His Son. Now, we might guess that first gospel occurs very early in the Bible, and here it is in the third chapter. We might also guess that it happens only after the Fall occurs. Because you have to understand the bad news before you can understand the good news. And chapter 3 is actually the chapter that tells the story of the Fall. 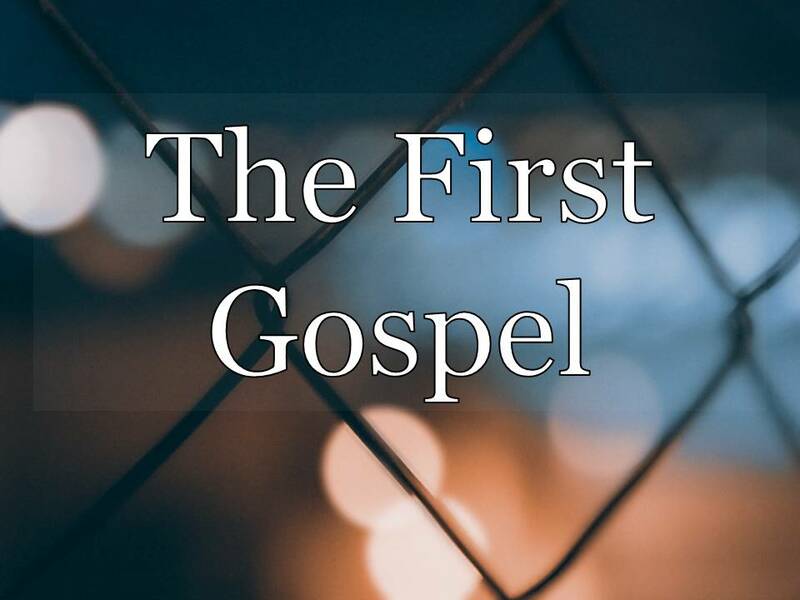 And we might also guess that this first presentation of the gospel would be very shadowy and almost ambiguous because there is a looooong time between this first statement of the gospel and the fulfillment of the gospel’s promises. And there is a lot of story to develop and a lot story to unfold before anyone could really understand what this first prediction of the Messiah was really saying. And that’s true, too. This one verse is shadowy, and if we didn’t have the rest of the Bible, I’d even say it was vague. But for most of church history, many followers of Christ have seen in this one verse the whole story of redemption in a nutshell. Christians have heard the good news about Jesus pulsating here in seed form and then growing out of this simple statement into the astonishing forest of redemption. However, what we probably would not guess, is that this first gospel was proclaimed to the serpent of Genesis 3, the tempter in snake form, the enemy, the “bad guy” in the story of the Fall. The first gospel appears as a part of the curse. We looked at this earlier in the Fall when we were talking about how the curse affects our work. Work is now tainted by toil and frustration and is characterized by groaning. The curse is the statement of consequences that came on us and our world when we fell into sin. The curse is the promise from God of trouble as a punishment for our rebellion. And that curse affects everything. 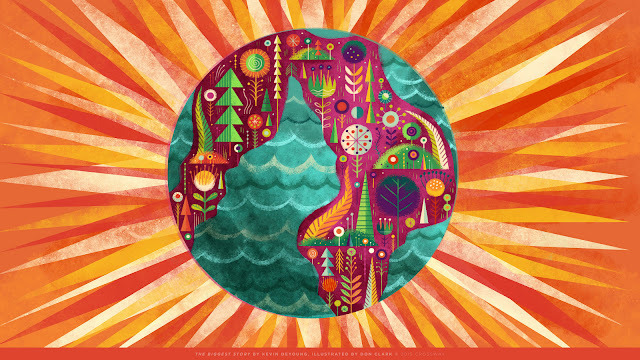 Humans and the whole world. You know the story. God made a world that was good and He made people to live in it as his imaging-bearing representatives. A first man, Adam and a first woman, Eve. And He gave them the responsibility of filling and subduing the earth. But they failed. God had given one prohibition–to not eat the fruit of a certain tree. And this serpent, a deceptive mouthpiece of God’s enemy Satan, tempted our first parents to disobey. The curse is the consequences of that sin. Shame where there had been intimacy. Fear where there had been innocence. Blame where there had been love. Pain, disrupted relationships, distorted work, a damaged ecology, banishment from the blessings of the garden, and worst of all, death. And there was curse on the serpent, too. A curse that involved both humiliation and hostility. In verse 14, the Lord tells the serpent who was the most crafty (v.1) that he will be the most cursed. You will be humiliated. You might think that you have won this day because Adam and Eve have sinned. You might think that you deserve an exalted position above all creation, but instead you will slither on your belly and eat dust in abject humiliation. Whenever we see a snake in the grass, we are reminded of the humiliation of the serpent’s curse. It’s important to understand the story that you are living in. A lot of people don’t realize that they are living in a story. They go through their life thinking that it’s just their life. They are not part of something bigger, something more complex. Life is just this thing that you muddle through, doing your best to survive or pursue happiness or whatever. But they don’t realize that they wake up each morning as a character in a great big story. Now some do. Some realize that there is a story going on with their life but most of them have the idea that they are the main character in that story. But we learned when we studied Genesis before in 2003 that we are not the main characters in the story in which we live. We all have much smaller roles to play. They are significant roles, but they are not central to the story. It’s important for us to understand the story that we are living in. Because understanding that story and where we are in that story will help us to understand what’s going on in our lives and guide us to make our choices as we live them. That was the point of the Challenge Conference in 2014. I remember seeing the lights go on for our students who were attending as they began to understand God’s Big Story and their part in it. Do you ever wonder why things are happening the way they are? While understanding the story doesn’t always given the specifics of why, it normally will supply the categories. The big story makes sense of the twists and turns of the plot. Understanding the story also helps us to understand Christmas. Why is there a Christmas? Why did Jesus come to Earth? Why was He born in Bethlehem? Why did the angels sing to the shepherds and the wise men visit from the East? What’s such a big deal that we would celebrate it this way every year? It’s important to understand the story that you are living in, and the First Gospel in Genesis 3:15 tells us the story in miniature. #1. WE LIVE IN A WAR-ZONE. The story of the world is a story of conflict, of unrelenting warfare. V.15 again. Want to know what kind of a story you woke up in this morning? There is a war going on. It’s part of the curse. And it is, surprisingly, good news. Because it’s something that God is doing. Notice what it says in verse 15. Who is introducing the enmity, the hostility, into the equation? This is something that God is doing. And it’s hard thing. It means bad things. War is bad news. But God always has a good reason for everything He does. For one, He is introducing hostility between two parties who had been temporarily allied. It doesn’t say, “I’ll go to war with you, Satan.” Though that’s part of what it means. Satan and God are already at war. But Satan may have thought that he had won. He had tricked Eve into confederating with him. He might have thought that Eve was on his side. But God says that He will step into that situation and assure that there is war between the woman and the serpent. And between the offspring of the serpent and the offspring of the woman. Well, a lot of theories could be advanced. You could guess that this is the offspring of the snake, which is other snakes, and the offspring of the woman would be humanity. So there is a war going on between snakes and men. That’s possible because really there is. Especially the more poisonous the snakes. But most of us think there is something more going on here. The offspring of the serpent could be demons as the family of Satan. And there’s probably some truth to that, as well. The unseen enemies, the principalities and powers with whom we are at war. But it’s more likely that the offspring of the serpent are those human beings who are under the sway of Satan. Those who listen to His lives and live in sin. They include the worst of people in the world...and some of the most religious. Jesus told the Pharisees (who were more religious than anyone in this room) that their father was the devil, who was a liar from the beginning, and he called them a brood of vipers, snakes. The offspring of the snake are those who believe the snake and do what he wants. And it’s what all of us naturally are. The offspring of the woman in this fight are those whom God has set apart to be His. God’s people. In this age, we call them “the church.” The people of God. They are the people whom God in His sovereign grace puts a love for Him and hate of sin in their hearts. They are the people of faith. Those who believe the promises of God and are saved. Sin introduced a terrible consequence–a spiritual battle with Satan and his people that rages across our world and across history. Of course, it’s bad news. War is always bad news. But war is sometimes necessary. It’s good news here because it means that Satan has not and will not win. Does that help you to understand what’s going on in your life right now? Why is life is so difficult? I’ve had a very difficult year. Perhaps the hardest year of my life so far. It’s up there with the year we lost our daughter to stillbirth and the year we lost Heather’s mum to cancer. And the last two months have just been really stressful for me. I had been recovering from my surgery and then Blair died. And I’ve had a lot of other stressful responsibilities that I have been carrying. And you know what’s helped me the most recently? It’s been our Hide the Word verse. John 16:33. Well, yeah, it is. Because that means that I’m in the right story. This is the story where we have trouble. Followers of Jesus have trouble! Don’t believe anybody who tells you that followers of Jesus don’t have trouble. Because Jesus said we would! We live in a war-zone. There is a spiritual battle raging around us. So don’t be surprised if things get a little hairy. And this also helps us to understand Christmas. Christmas isn’t about nice stuff. It’s about war. Jesus came to win this war! But now, I’m getting ahead of the story. First, I’ve got to give an application of point #1. Make sure you’re on the right side. If we are living in a war zone, if that’s the story we live in, it’s important to make sure you’re on the right side. Are you offspring the serpent or offspring of the woman? And I’ll tell you that everybody is born onto the wrong side. Ever since Adam and Eve, our whole race has been born on the side of the snake. So it takes repentance, which is treason against Satan[! ], and faith in Jesus to get onto the right side. You don’t get born onto the right side even if you are born to a Christian family in so-called Christian nation. You’ve got to cross over the line and join up with the other side. Have you left the service of the serpent and entered in the army of King Jesus? Here’s one way that you know. That’s Jesus for you, and His followers, His disciples, are becoming like Him. Do you hate sin and do you love other sinners? That’s how you know if you’re on the right side. You’ve put your faith and trust in Jesus and you are becoming like Him. Because faith, hope, and love are the “weapons” of the Christian. They are how we fight on our side of this battle that has been raging all through human history. Friends, let’s not get caught up in unbelief, fear, and hate. I see a lot of that in our culture right now. Including among those who claim the name of Jesus. The right side is faith, hope, and love. Because there’s a war on, and it’s going to get dicey. And here’s where it the good news part really shines. #2. THE OUTCOME HAS BEEN ALREADY DECIDED. Yes, we’re in a terrible war. But the outcome of this war has already been decided. It was from the first. Jesus Christ has won and is going to win this war. V.15 again. Now, at first, it’s not clear who will win this war. The word for “crush” and the word for “strike” are actually from the same Hebrew root word. And it says that the serpent will strike at the heel of the offspring of the woman. That’s the normal approach of a snake isn’t it? To lash out and get a winning venomous blow in the heel, taking his enemy down. So is this just an equal battle for all eternity? No. Don’t forget where this prophecy sits. It’s part of the curse. This is bad news for the serpent. Very bad news. Not just that he hasn’t won as he thought and now has a long war of ahead of him. But that he is going down. The seed of the woman will crush his head. The people of God will triumph over the Deceiver. This is the First Gospel. God’s people will win in the end. The outcome has already been decided. And the ultimate offspring of the woman is Jesus Christ Himself. Do you see that little word “He” in verse 15? In the Hebrew, it’s a little third person personal pronoun to refer to the offspring of the woman. It could represent the people of God corporately, but Christians have always seen Jesus Himself in that little word. And some Jews saw the Messiah in it centuries before Jesus was even born. In some ways, the whole story of the Old Testament is a hunt for the “he” of verse 15. 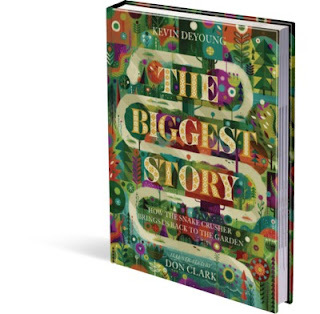 Have you seen this children’s book called The Biggest Story by Kevin DeYoung and Don Clark? It’s not really for little kids. It’s more for big kids who love complexity and artistry. I love it. It’s just gorgeous and theologically rich. God was not happy with Adam and Eve. He wasn’t happy with the Snake either. God put a curse on the man and the woman and the Snake and everything else. He kicked Adam and Eve out of the garden Paradise he had made for him. It wasn’t possible for a people who were so bad to live with a God who is so good. But before they left, God made a promise. He promised that the evil Serpent, the Devil, would always be a war with Eve and her children. Now that doesn’t sound like a very nice promise–that bad guys and good guys would fight all the time. Who wants to live in a war that never ends? But here’s where the good part of the promise comes in: God promised that one of Eve’s children would, someday, eventually, sooner or later, crush the head of that nasty Snake. Do you see how Genesis 3:15 is a messianic prophecy? The whole Old Testament is a search for that conquering snake crusher. Is it Isaac? Uh uh. Is it Jacob? No way! Is it Joseph? Not quite. Is it Joshua? Not really. It certainly wasn’t one of the judges. How about David? Well, it almost seemed like it, didn’t it? But it wasn’t him and it wasn’t any of his sons. Until the invasion of our world by the enfleshed son of God. Christmas is the game changer. Because when Jesus was tempted just like Adam and Eve had been–though His temptation was much harder, in a desert instead of a garden!–Jesus was victorious where Adam and Eve had failed. And then on the Cross when the Serpent struck at his heel, and He even died, Jesus still didn’t lose! Jesus won at the Cross. He won this battle at the Cross. He paid for our sins at the Cross. Satan was defeated the Cross. At the Cross, Jesus was putting an end to the this unending war. Right? What’s our Hide the Word verse say? He’s won the decisive battle. And so we can have peace and joy and courage. I know that it doesn’t feel that way all of the time. It’s hard to take heart. It’s hard to see that Jesus has overcome the world because He has not yet returned to make His blessings known as far as the curse is found. We are still living in the war-zone. And we have to keep watch like we talked about last week while wait for that victory to be spread around the universe and that peace to become universal. And that needs to be good enough for us for now. Let me give you one more verse to chew on. It’s in the book of Romans chapter 16, verse 20. If the Lord gives me strength, we’re going to return to Romans in a few weeks in the new year. So, I’m giving you preview of coming attractions. Listen to Romans 16:20 and hear the echoes of Genesis 3:15 and John 16:33. We will share in His victory. One day this war will be over and those who belong to Jesus will also be overcomers. Because Jesus came at Christmas to overcome. The Snake Crusher is coming back again to wipe away all the bad guys and wipe away every tear. He’s coming to make a new beginning and to finish what he started. He’s coming to give us the home we once had and might have forgotten that we lost. So keep waiting for him. Keep believing in him. Keep trusting that the story isn’t over yet. God’s promises never fail and the Promised One never disappoints. One day we will see him. One day we will be with him. One day there will be nothing but the best days, day after day after day after day. During this year’s Advent season, we are contemplating together our Lord Jesus’ promise from the Gospel of John, chapter 16, verse 33. Our first candle was a candle of lament. It told us that our world has been full of trouble ever since the garden of Eden and that it is good and right to express grief, sadness, and longing for our broken world to be fixed. Our second candle was a candle of hope. It reminded us of the promise of the Prince of Peace. His peace is unlike anything the world offers and will never end. And that gives us something to hope in. Our third candle is a candle of courage. Because our hope is in Jesus, we can take heart and be courageous right now. Even though our broken world is full of danger and trouble on every side, we do not have to live in fear. We also do not need to be afraid. Christians know already how our story ends and that changes how we live in the here and now. Be courageous and take heart! This last group of workers is one that I’ve mentioned every week in this series but haven’t yet asked for them to stand. So, this is all of the students. 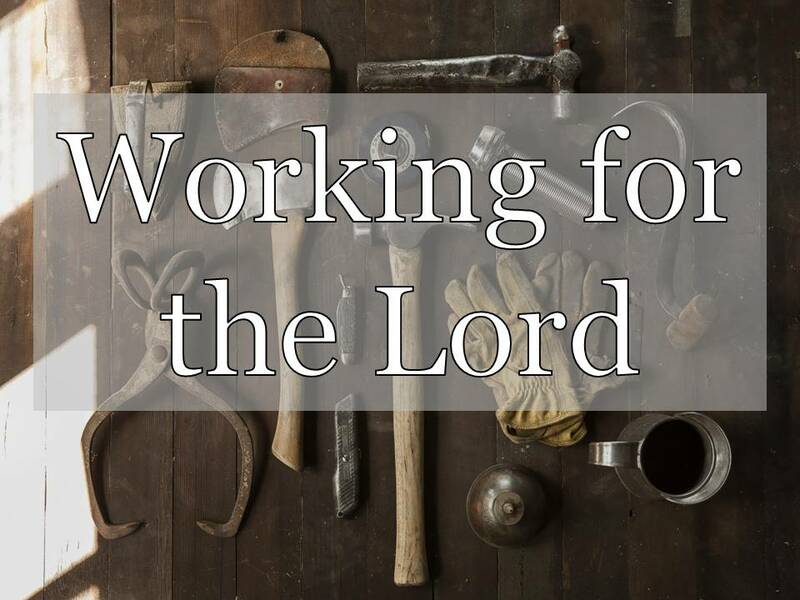 We’ve said that the second, third, and fourth graders all are workers and should do their work for the Lord. So, I want all of you students to stand. And this is all of the retired people. If you haven’t stood already for a field of work, this is your time. You continue to work. I remember Blair Murray used to say that he was so busy, he didn’t have time to have a job! And this is for all of the folks who are unemployed right now. You are looking for work and that is your work. And this is also for those who are disabled and unable to work for compensation right now. You might not even be able to stand today, but we recognize you anyway. Because when it comes to our work, contribution is much more important than compensation! So all of you workers who are not compensated, I’d like you to stand now and be recognized and celebrated. Thank you! Thank you for your contribution to our community and to the common good. Your work matters. God cares about it. I know that can be hard. Do your best. Your work is worship. Your work is discipleship. You work matters to God. All of you, thank you. Well done. Good job! Our key verse all Fall has been Colossians 3:23 and 24. And what do you want your Master Messiah, your Lord Christ, to say to you when your work is all over and done? 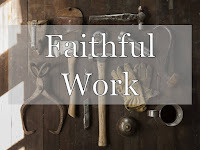 Today’s message is entitled “Faithful Work,” and it comes from Matthew chapter 25 verses 13-30 which is part of what Bible scholars commonly call “The Olivet Discourse,” that long teaching segment of Matthew chapters 24 and 25 where the Lord Jesus on the Mount of Olives taught His disciples about the end-times, about the end of the world and about His return, the second coming of Christ. The theme that keeps repeating throughout this section is that Jesus’ disciples should live in constant expectation and readiness and watchfulness because we do not know when Jesus will return. Jesus has said something like that in chapter 24, verse 36, verse 42, verse 44, and verse 50. And then in this chapter, he tells three stories to illustrate the principle. Our story for today is the middle story of the three. But the point of all of them is that we should be watchful and ready for the return of Jesus Christ. We are closer than ever to the return of Jesus Christ. Now, I’m NOT saying that we are living in the last of the last days. I don’t know that. Sometimes it feels that way, doesn’t it? Especially with the headlines that we read in the newspaper? Some of you have asked me recently to do more teaching on the End Times because it feels like we might be in them. But we know that Christians throughout history have felt the same way, that their generation may be living in the last of the last days. And we also know that the Lord Jesus told us specifically to not be setting dates and that things like false messiahs, wars and rumors of wars, famines, and earthquakes and all kinds of bad things like that do not tell us that the end has arrived. Jesus made that very point in chapter 24. Those things must happen but the end is still to come. They are beginning of the birth pains, not the end. We are living in the last days, the days between Jesus’ first coming (Christmas) and His second coming. And just because of the passing of time, we know that we are closer now than we have ever been to the return of Christ. And the question is, how are we supposed to live while we wait for His return? V.13 again. Keep watch. That’s how we are supposed to live. Expectant, anticipatory, longing, leaning towards it, ready for Him to return. But! This watchfulness is not at all supposed to be passive. While we are waiting for the return of Christ, we are not supposed to just lean back and lay around. It’s not that kind of waiting. It’s not like waiting at the bus stop or the airport terminal. Nothing’s happening. You just sitting there until your ride comes. Some people in the Bible were like that. Some of the men at Thessalonika had quit their jobs and were just waiting around because they thought the return of Christ was right around the corner. And then it didn’t happen like they expected, and they didn’t have anything left. How disorienting would that be? What did Paul tell those men at Thessalonika? Get a job! This “being ready” or “keeping watch” is not a passive thing like waiting for the bus, but it’s an active thing. There are things to be doing while we are waiting. We are given a job to do. Verse 14. Jesus is telling a parable. And it’s not that hard to interpret, at least the main points. The man going on a journey is who? Jesus Himself. And the servants are who? They are us. They are people. It’s a little confusing because a “talent” in Greek is a unit of money measurement, not our gifts and special abilities like how we use the word “talent” in English. It’s confusing because we actually get our word for “talent” from this word and this story, I believe. Because we all have gifts that God has given us, we call them “talents” after these piles of money. The 2011 NIV just calls them “bags of gold” which is actually very helpful for getting the picture of what’s going on here. Because this was, in the story, a whole lot of money. One “talent” or one bag of gold was equivalent of 20 years wages for a day laborer. I’m not sure how to translate that into today’s dollars. What would a day laborer make right now, multiple that times 20 years of days. That’s big chunk of change. He had a good idea of what each one could handle. And so he entrusted that amount to each one. Now, what do the bags of gold in this story stand for in real life? Well, I think that they’re everything and anything that the Lord has entrusted to us. So they are what we call our “talents,” our gifts and abilities. And they are our money which we are supposed to be stewards of, money managers for God. And they are also our assignments in life...including our jobs, our callings. These talents in the story are the gifts and assignments that the Lord has entrusted to us to manage and do while we wait for His return. So, put your job in that word when you see it there. You have been entrusted with your work. It’s your assignment right now, and the Lord has put it in your hands to manage until He calls you to another job or until your work on earth is done or until He returns. Now, a couple of things to notice about this. First, notice that we are to expect some kind of delay. The master goes off on a journey and doesn’t come back right away. Some people think that because the New Testament emphasizes expectancy, that nobody in the New Testament could have guessed that it would be some time until Jesus returned. Just because the Bible calls us to be ready at any time doesn’t mean that the apostles made a mistake in thinking that it was going to be soon. Right here, the master goes on a long journey, and it will be long enough for the servants to get some work done investing his gold while he’s gone. I don’t think we should be surprised that Jesus has not yet returned. Peter says that He’s being patient and giving more people more time to repent. But on the other hand, that doesn’t mean that he isn’t coming back soon. We don’t know when, so we need to be ready. Which means staying busy with what he’s entrusted to us. Second, we shouldn’t get jealous of other people’s gifts and assignments. Some get 5 bags of gold, some 2, some 1. But everyone gets something to do. And it’s based on how He sees things working the best. So, we shouldn’t be despising someone who has a different calling that we do. Don’t look around the room and envy the people who stood a different week than you did. Or look down on the people who stood a different week than you did. Just do what God calls you to do. Just be grateful to have been entrusted with what God has put in your hands to manage. ...And be faithful with it. You can see where this story is going! Two kinds of workers. Faithful and unfaithful. 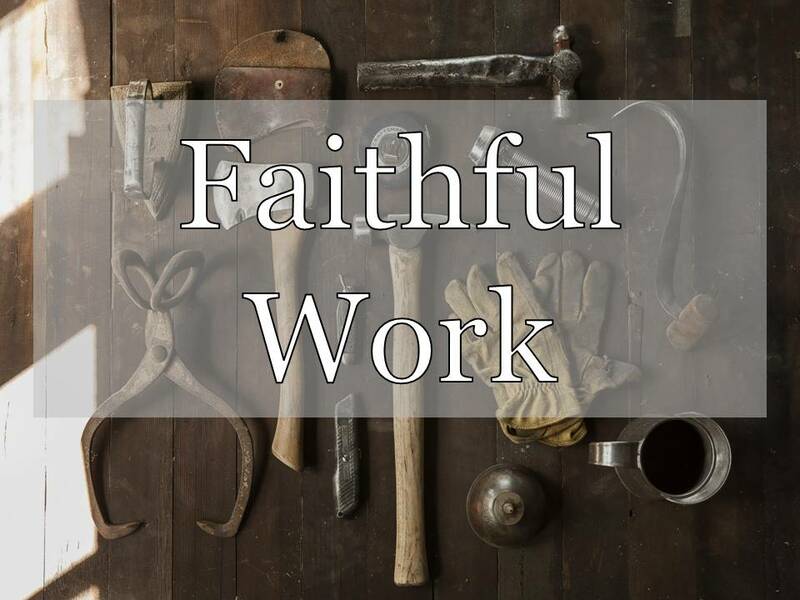 How many faithful workers are there? Two. How many unfaithful workers? One. How many were entrusted? Three. They all were, right? Everybody has been given a job to do. The question is not whether or not we have a job but whether or not we’re going to be faithful with it. Now, I think that this applies directly to evangelism, with sharing the gospel. It applies directly to missions, to spreading the gospel. And it applies to all kinds of church work, building the church around the gospel. The first application of this call to faithfulness is gospel ministry and disciple-making. But what have we learned this Fall? We’ve learned that it’s all ministry. That our work is discipleship. That our work is worship. So it’s all kingdom work in some way. The question is whether or not we’re going to be faithful at doing it. Do you feel that? I hope that everyone is beginning to get that. God has entrusted you with a job to do. And He cares whether or not you do it. And How you do it. Do you do it in the way that He wants it done? Everything that we’ve talked about all Fall. It comes down to this, will we be faithful or not? You know it’s funny. We tend to think that if this is the End Times then what we need to do is to freak out. Stock up on canned goods and dry foods. Fill your basement with guns. But Jesus said that when then end is drawing near, we should just stay busy about His business and faithfully do our jobs. If the end is near, then we should be getting up and going to work. How do you want your Master to find you when He returns? I don’t know about you, but I want to be working at what He told me to do. Those are sobering words, aren’t they? There will be accountability for our performance with that which He has entrusted to us. Do you have a performance review at work? I have one every year done by the elders, and I do one for Marilynn every year. But this is the ultimate performance review. Are you ready for it? What did you do with what I left in your hands? How did you invest your life? Your gifts and your assignments? #3. WE WILL BE REWARDED. If we are faithful, we will be rewarded. I love those words in verse 21 and again in verse 23. And I long to hear them said to me. That would be reward enough. To receive the commendation of our Lord Jesus Christ. But there is more than just commendation. There is, somehow, more responsibility. I think that points to the way things will work in the future, in the kingdom and the new heavens and the new earth. There will still be work in the consummation. Remember when we said that back in September? It just will be work without the curse. Work but not toil. Work with no groaning. All groaning with be gone. But contribution will not. Work will still be there. And if we are faithful now with the few things that the Lord has given us to do, then we will get more and better to do then. Isn’t that a great incentive to faithfulness now? God has an incentive program for our work, too! You have been faithful with a few things; I will put you in charge of many things.” Let’s get going and party! Now, again, notice that the reward is the same for both the 5 talent guy and the 2 talent guy. We should not assume that because someone has a big job to do here that they will experience more blessing in the life to come. 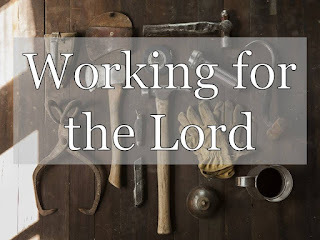 What we can expect based on just this parable is that if we are as faithful with our job as someone else is with their’s, we can both expect the same commendation and more responsibility and a hefty common portion of our Master’s joy! No matter what your job is, if you are faithful with it, you can expect to share in the happiness of Jesus Christ! He almost seems mad at the master, doesn’t he? “Why did you give me this job? I don’t love you or trust you. I’m just sacred of you. So I disobeyed you. The master’s been gone a long time, and this guy has nothing to show for it. Just an assignment that he didn’t lift a finger to do. What a scary phrase to hear from the Lord Jesus, “you wicked, lazy servant!” You sluggard, you slacker, you have been worthless. The condemnation of the judgment. Unbelievers will lose the life and talents and assignments and treasures and all kinds of other gifts that they have received in common grace if they will not trust the Lord Jesus and show that they trust the Lord Jesus by obeying the Lord Jesus. But those who do believe Him and trust Him and put their faith in Him will show it by being faithful to Him. That’s what I want for all of us in this room. And it comes as the fruit of faithfulness. So are you being faithful to your callings? If you died today, what would you expect your Master to say to you? What do you need to change to know that you will hear it? Whatever your job is, whatever your callings are in life, they are callings of the King, and He wants you to be faithful to do them in anticipation of His return. That’s how we are to live in these last days. Actively busy with our business for the King. Ready for Him to return and inspect the troops. Yesterday, my son Peter got a buck. His first deer, and our family’s first buck, and I’m pretty proud of him. When the buck first appeared on the horizon, I was on my phone. I was shopping for health insurance with my freezing little fingers. I wasn’t really hunting. But Peter was. He was watching, watching, watching. He was ready. But he wasn’t just sitting there. He was active. He had his eyes peeled, and he was scanning the horizon. He was busy doing what he was supposed to be doing. We didn’t know the day or the hour that that buck would come through, but Peter was ready. I know that some of you are worried by today’s message. But you know how much you have failed. You know that you have not been consistently faithful. You have a tender conscience, and this message almost makes you feel crushed. There is good news at this table for you. This table stands for the Cross of Jesus. And at the Cross, Jesus took all of your failures and paid for them. And at the Cross, Jesus was crushed so that you would not have to be. And at the Cross, Jesus gave you His perfect track record of faithfulness. There was nobody who embodied “good and faithful servant” like Jesus did. But He died the death of a criminal. He died like a wicked and lazy servant deserves. He did His job faithfully, and He offers that gift to you and me. Your sin on Him. His righteousness on you. If you know Jesus in that way, then you are invited to eat and drink in celebration of Him. If you do not know Jesus like that yet, then now’s the time to trust Him. I invite you to put your faith in Him now. Turn from your sin and receive the Savior. Let the plates pass you by. Instead, use this time to place your life in the hands of Jesus and trust Him as your Lord and Savior. Because One day soon He will return. One day, we will definitely be in the last of the last days. But we don’t know the day or the hour so for now, we trust God, we keep watch, and we stay faithful.